As you may have already seen if you are a regular follower of our Instagram and Twitter feeds, our collection of Giusti Plaster Cast material is now live on our online catalogue. Making this happen was University of Glasgow Technical Art History student Riley Cruttenden who has kindly written a summary of his findings below. Enjoy and don’t forget to check out the collection itself here! Giusti & Co. was a Glasgow-based company that specialized in plaster mould making and plaster casting. The firm was founded in the mid- 19th century by Italian immigrants and continued to operate through the early 21st century. The Glasgow School of Art employed J. Giusti & Co. in various capacities from at least 1890 through 1996, and a recent donation of moulds and casts from the J. Giusti & Co. workshop has provided new insights about the company and its relationship to the GSA. In particular, the collection highlights the material practices of J. Giusti & Co. and the company’s role in maintaining plaster casts as teaching tools at the Glasgow School of Art. Plaster casts were important teaching aids from the school’s earliest years through the mid 20th century, when teaching from casts grew out of style. 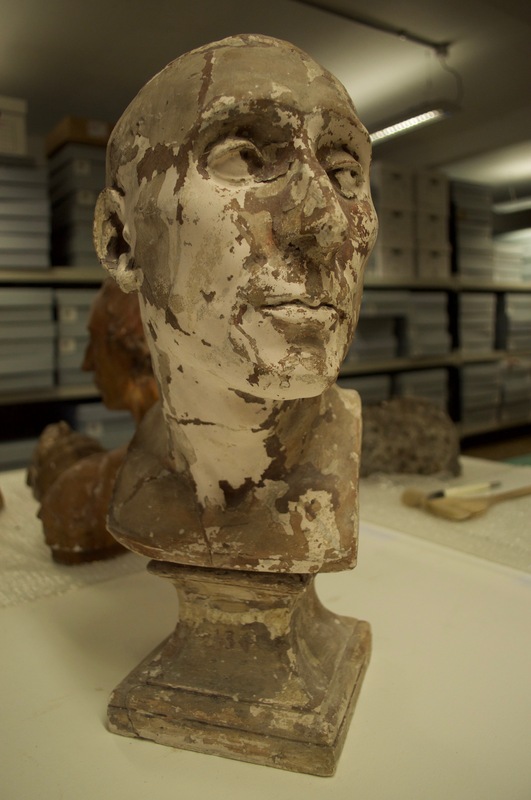 Traditional art historical research methods were combined with scientific analysis to reveal how J. Giusti & Co produced plaster casts and how the Giusti Plaster Cast Collection relates the history of learning and teaching at the Glasgow School of Art. Previous research on plaster casting in Britain, information from 19th and 20th century business directories, and materials from GSA Archives and Collections were combined to assemble a history of the Giusti company. Materials were investigated by visual analysis, optical microscopy, and Fourier transform infrared (FTIR) spectroscopy. 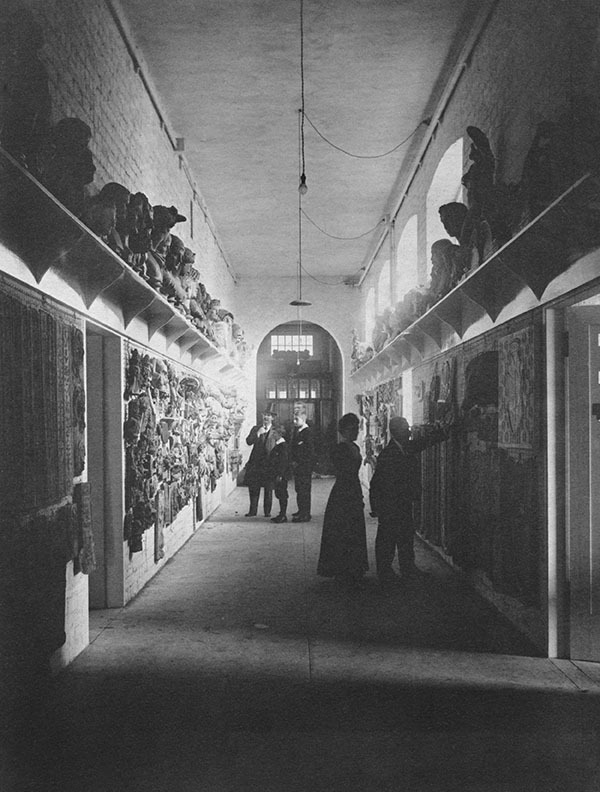 Services provided by J. Giusti & Co. for the Glasgow School of Art can be grouped into four key areas: copying student work (no surviving casts identified), providing casts of original designs, repairing casts owned by the school (Figure 1), and copying casts designed by other companies (Figure 2). In an analysis, the bottom/interior layers of paint samples from three separate items were an excellent match with a slaked calcium sulfate (plaster) reference. The top/exterior layers of the same paint samples were a good match with an unwaxed, decolourised shellac reference. Surface finishes and macroscopic details of items in the Giusti Plaster Cast Collection make visual analysis useful in discerning how the items may have been used in the past. In most cases, the yellowish, brown, and reddish surface coatings on items are likely shellac. 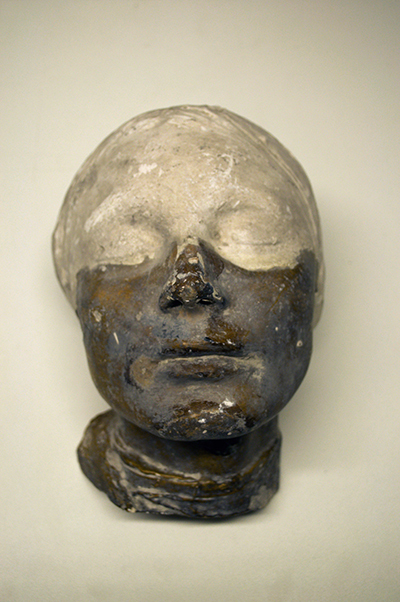 Shellac was used as a sealant to facilitate the making of moulds and further plaster casts. Inscriptions, maker’s stamps, and visible repairs are also useful in tracing the history of individual items. The Giusti Plaster Cast Collection documents how plaster casts were produced, copied, used, and cared for in Glasgow while tracing connections between J. Giusti & Co., the Glasgow School of Art, and plaster casting firms across Britain. “J. Giusti and Co.” Mapping the Practice and Profession of Sculpture in Britain and Ireland 1851-1951, University of Glasgow History of Art and HATII, online database 2011, accessed March, 2017, http://sculpture.gla. ac.uk/view/organization.php?id=msib1_1260870191. Kurtz, Donna. The Reception of Classical Art in Britain: An Oxford Story of Plaster Casts from the Antique. Oxford: Archaeopress, 2000. Malone, Peter. “How the Smiths Made a Living.” In Plaster Casts ed. by Rune Frederiksen and Eckart Marchand, 163-178. Berlin: De Gruyter, 2010.